In its most simple form, cooking is done by placing raw meat, bread dough or cattail roots in the fire pit. This makes these 3 types of raw food edible. All other ingredients require a clay pot to be cooked. Raw or simply cooked foods give you 10 seconds of time until your saturation starts to drop again. The player starts with 15 base health points and you can increase that until 25 hp by consuming a balanced diet, this where more advanced meals are particularly useful for - they let you create mixed nutrition meals. Please be aware though, your nutrition levels do not increase if you eat while completely saturated. You can check your current levels on your character dialog, mapped to 'C' by default. 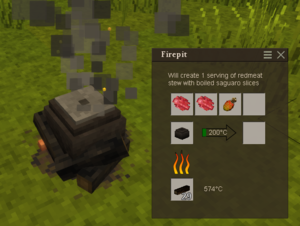 To prepare more wholesome meals, you need to craft yourself a clay pot using the clay forming mechanic. 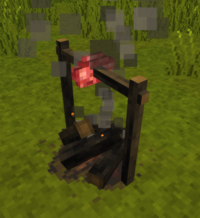 Once you burned the clay put, place it back into the fire pits input slot and you are ready to cook some meals. The saturation of meals are merely the sum of it's part. So what you put into your meal is what you will get in terms of saturation. In addition, for every 100 saturation you will get 30 seconds more time until your saturation bar starts dropping again. There are 4 base types of meals, each require certain types of ingredients and allow certain types of optional ones. To create one serving, you must only put 1 item per slot. So even when the porridge requires 2 grain, you must add 2 individual pieces into 2 slots. You can then increase the amount of servings by increasing the amount of items in all slots simultaneously. The cooking pot allows you to cook up to 6 servings each time. To eat a meal, place your pot of cooked food onto the ground or table, then right click on with a empty bowl in hands, or vice versa. To make a porridge you need at least 2 grain. The porridge is the only exception on the "sum of its parts" rule. A cooked piece of grain will yield double the saturation. To make a soup you need at least 1 portion of water and 1 vegetable. You can add water with a filled water bucket. Left click to add one portion of water, right click to remove one portion. Requires at least 2 vegetables. This page was last modified on 14 October 2018, at 13:28.